Delhi is a spooky place – or so it is believed. Now the Indian Paranormal Society, and a travel company, Let’s Get Packing, have decided to explore haunted places in the Capital and also Mumbai, Kolkata and Bangalore. Last week they organised a tour, Creatures of the Night which took tourists to Jamali-Kamali’s tomb, the Mehrauli Archaeological Park and Nicholson Cemetery. How many ghosts they contacted is not known but their K-2 meters were able to record some unusual things, like the smell of sandalwood at Balban’s tomb (possibly a Thursday ritualagarbatti for the slave king who was a quite a scrooge) and a shining red triangle at a mosque, to quote a story in a daily. But the ghost-busters were silent on what happened at the cemetery. They expected to see the headless spectre of Gen Nicholson who was shot near the Khari Baoli during the British assault on Mori Gate by a sniper standing at the window of a double-storeyed house. A marble tablet still marks the site. Though mortally wounded, he breathed his last only after Delhi had been retaken, with the words, “Thank God, I can now die in peace”, or something to that effect. The story about the headless soldier is associated with another site – the Delhi Gate, where a British sentry shot himself after the woman who swept the road every morning, with whom he had fallen in love, got married. The yarn is that he walks from the gate right down Daryaganj street and later disappears into the nearby Lothian Road Cemetery, where he was presumably buried. 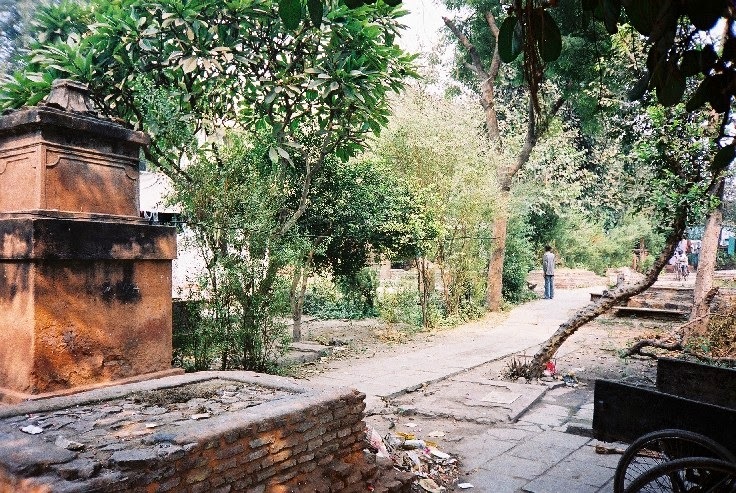 The pipal tree at the Delhi Gate is also said to be haunted by a banshee (wailing churail) who sometimes troubles passers-by late at night by making a jingling sound with her anklets. Incidentally, the Lothian Road Cemetery, the oldest existing one in Delhi, is believed to be the most haunted as many of those who were killed in 1857 are buried there. Even during the day the cemetery looks a spooky place with tumbled-down tombs all around and a weird middle-aged woman sitting under a tree to quench the thirst of stray visitors in the afternoon. Another story would have us believe that every Thursday, the last Emperor Bahadur Shah Zafar and his begum Zeenat Mahal, lead a procession of their courtiers, and members of the harem, out of the Red Fort and back into it. This is surprising since both Bahadur Shah and Zeenat Mahal died in Rangoon (now Yangon) and were buried there. Ghosts are never known to cross such long distances as the one between Delhi and the Myanmarese city, where Zafar is honoured as a pir who grants wishes to those who light candles and joss-sticks at his mazaar, though he poetically mourned that there would be none to do so after his death. Many years ago the Custodian of the Red Fort, Asghar Ali Khan, reported seeing the ghosts of Mughal princes and princesses during his nightly rounds of the fort. Later a photographer of a daily spent a night there photographing paranormal activity but his pictures showed either blobs of light or some weird skeletal images of which nothing much could be made. The Army authorities of the fort tried to bring the issue to an end saying some soldiers used to frighten the custodian by pretending to be princes and princesses but the matter did not die down so easily, with Asghar Ali Khan holding his ground and swearing that he was not so naïve. It later emerged that the Army authorities were trying to put an end to the ghostly yarns as they were hurting its image in the public eye. Students of paranormal happenings can also try their luck on the Ridge, where some of the bloodiest events of 1857 took place. As a matter of fact, young doctors of Hindu Rao Hospital, which was once a British mansion, reported seeing firangi “bhoots” while going to a canteen for tea during night duty or biking down in the dark to the hospital. Panchkuian Road cremation ground and its roundabout are also said to spring a ghostly surprise now and then, like a motorist who honked to get a man out of the road one night and unable to stop, drove right through him. On looking back he saw the man strolling on Link Road just as before, unmindful of another approaching car. C.P. and Bhadur Shah Zafar Marg also have their own phantoms.